There are two ways to increase sales. You can sell existing products to new customers, or sell more products to your existing customers. Since it takes a lot more time and money to find and win new customers, it’s easier to sell more products to the people who already buy from you. One of the ways sign businesses can do that is by expanding from vinyl graphics into trophies and awards. Since so many people use trophies, awards, and promotional items, it’s very likely that some of your commercial sign customers are already buying these products. Why shouldn’t they buy them from you? Expanding into awards & trophies makes sense for sign makers. You can use your expertise with vector graphics and plotters to quickly master rotary engraving. 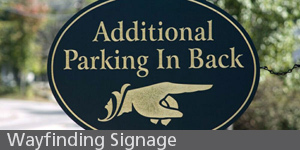 Some sign software can be upgraded to engraving applications with the addition of a simple plug-in. Since there is so much overlap between these industries, rotary engraving might be the business booster you need to reach the next level. How does it work? What are the target markets and profitable products? What kind of equipment and software do you need? The answers to all of these are provided below. 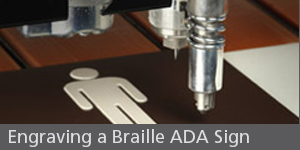 Braille ADA signage is just one area you can expand into with a rotary engraver. The rotary engraving process is very similar to the production of vinyl graphics. Vector software is used to design the image and send it to the device, which interprets the vector data along X and Y axes to cut a design into a substrate. The added dimension of engraving is the ability to control not only the length and width of the graphic, but the depth as well. This value is determined by the Z axis. Depending on your engraver, you may set the Z axis value in the software so you can control how deeply the engraver carves out the substrate. The software used can be a basic plug-in such as Roland DGA’s Engrave Studio or a full blown engraving design package like FlexiENGRAVE from SA International or Cadlink’s Engrave Lab. Since engraving adds the possibility of Z axis or depth control, one of the first things to learn is the difference between the two types of output possible. These are scribe engraving and cutting. Scribe engraving only scratches text or graphics into the surface of a substrate so Z axis control is less of a concern. Scribe engraving is most commonly used on brass plaques and jewelry. Standard engraving or cutting carves into the substrate and removes the top layer to produce a relief effect. The use of substrates with different colored layers produces contrast by carving away the top layer to reveal the different colored substrata. This requires the use of softer substrates like plastic or acrylic sheets. So that’s how rotary engraving works. How can you turn that process into profit? We could devote this entire article to the various applications for rotary engraved products. Most of these are jobs for which sign makers are already qualified by virtue of expertise with vector graphics and corporate branding. Wayfinding signage: Architectural Wayfinding signage is a perfect compliment to commercial storefront graphics. This segment gives sign makers a perfect opportunity to “up-sell” commercial clients. In addition to making their storefront and window signs, you can add interior and/or exterior wayfinding signage that coordinates your customer’s colors, logos, and branding. If you haven’t already done so, try to establish a contact at “City Hall” or your local Chamber of Commerce so you can be alerted whenever a new business license is granted. That may give you a chance to be involved with the new owners as they plan their signage and corporate branding. To sell wayfinding signage without bundling it with outdoor graphics, seek out architects, hospitals, and hotels. Trophies and awards: Since it’s a mixture of B2B and B2C*, the awards market is perhaps the largest engraving market. Everyone from businesses to bowling leagues needs them. Your success in selling trophies and awards can be enhanced not only by traditional advertising, but also by networking in your community. You may find these customers at youth baseball, soccer, football, and basketball leagues, public school districts, clubs, civic organizations, colleges, and churches. ADA signage: Braille and ADA signage is required in many business and government buildings. If they have to buy it, why not let them buy it from you. There is a patented licensed process for engraving ADA signage that includes a raster pen for inserting the Braille ‘beads’ into the substrate. Roland DGA has a complete ADA kit that includes an appropriate engraver, software, Braille and Profile Cutters and the raster pen and license. Click here to find out more about this opportunity. Rhinestone decorated garments: Yes, rhinestones. Rhinestone decorated garments are another enormous B2C market that can be tapped by rotary engraving. You can use the same acrylic substrates designed for nametags to transfer hot fix rhinestones to apparel. Not all engravers are ideal for rhinestones, but the EGX-350 is an excellent platform for combining rhinestone shirts, gifts, nametags, awards, and ADA signage. The right engraver can flood your business with new sales opportunities. *B2B=business to business, B2C=business to consumer. Speaking of equipment, there are several options in rotary engravers with widely varying capabilities and costs. There are engravers available from several manufacturers including Roland DGA, Gravograph, and Newing-Hall. Roland DGA has leveraged its knowledge of the sign industry to engineer a line of engravers that are economical and easy to use. Roland engravers generally offer features, utility and value that cannot be matched elsewhere. Roland’s EGX series is a complete line of engravers ranging from the simple, affordable EGX-20a to the industrial strength EGX-400/600. For advanced applications like engraving jewelry and glass, the newer EGX-360 is the cream of the crop. Here’s a quick overview of the product line. EGX-20: The most affordable engraver on the market offers some surprisingly advanced features including Z axis control for engraving on curved surfaces. This compact unit is ideal for use in mall kiosks, small sign shops, and other environments where workspace is limited. It has a 15,000 rpm spindle speed and is suitable for cutting plastics and scribe engraving on soft metals. Its work area is 6” x 8”. All this utility is priced at only $2,995.00 and is backed by a one year warranty. 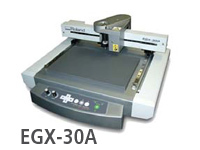 The EGX30A is the third generation of a desktop engraver that has been providing reliable service for well over a decade. This affordable unit offers an 8” x 12” work area and supports diamond scribing on soft metals and cutting acrylics and plastic. 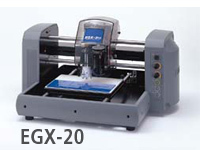 For affordable 2D engraving, there’s not a more accessible platform than the EGX-30A. It’s available for less than $3,995.00 with a one year warranty. 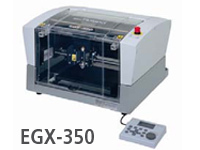 EGX-350: The 350 is the most affordable high speed industrial strength Roland engraver and offers amazing versatility. It has Z axis control for precise 3D engraving, a 20,000 rpm spindle speed for easy scribe engraving of soft and hard metals including stainless steel, and a V-carving mode for a hand carved look. The work area is encased in a clear cover for safer operation. 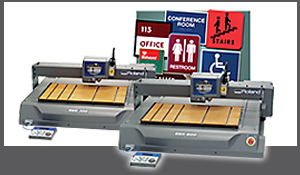 The EGX-350 can be used for all kinds of engraving applications including production of ADA compliant Braille signage and rhinestone apparel decoration. The MSRP of $5,995.00 includes a one year warranty. 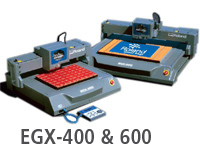 EGX-400/600: The EGX-400 and 600 are designed for high volume industrial engraving. They use digital servo motors for extremely precise engraving, have large table areas, and a pass-through workspace design that supports assembly line production. Automatic surface detection and a high 30,000 rpm spindle speed enable scribe engraving on the toughest metals with amazing precision. At $10,995.00 – 13,995.00 with a two year warranty, these workhorses offer exceptional value. 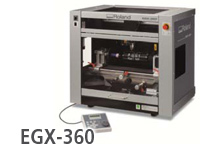 The Roland EGX-360 is self contained and designed for Kiosks. EGX-360: The 360 adds jewelry and glassware to the applications list. A unique optional vise supports engraving inside and outside jewelry, a feature not available on other products costing thousands more. An environmentally friendly circulating water system supports safe and efficient etching of glass, crystal, and marble. Water minimizes glass debris and tool friction. If you want an engraver that will allow you to say “Yes!” to any customer, the EGX-360 is for you. 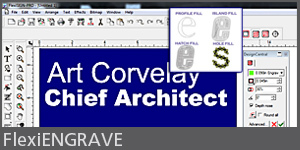 FlexiENGRAVE is complete engraving software featuring “Design Central”. As noted above, you’ll need some dedicated engraver controller software. All Roland engravers come with basic software such as EngraveStudio or 3D Engrave. These can be used with CorelDRAW or Illustrator to expand your design toolbox. FlexiENGRAVE is an optional module for FlexiSign that turns your sign software into engraving software. It offers an extensive feature set including single, double and triple line engraving fonts and multiple fill patterns. The fill patterns include a hole fill option for Braille fonts. A customizable tool library allows you to store color-coded settings for each of your cutting and engraving tools. The auto serialization feature supports batch production of name tags and badges. In addition to all these engraving features, the interactive Design Central window presents the tools you need as you need them. This ingenious feature shortens the learning curve so you can quickly become proficient and productive. Tools and cutters sold at SignWarehouse. Tools for Roland rotary engravers fall into several categories. The most commonly used are carbide tipped cutting tools, high speed steel engraving tools, and diamond scribing tools. These come in two shank sizes suitable for desktop and industrial engravers. The EGX20, and EGX-30A desktop engravers use the smaller 1/8” (0.125”) shank tools. The industrial strength EGX-400 and 600 use only the thicker 11/64” (0.171”) tools, and the EGX-350 and 360 use both. Micrograin carbide cutters are rotating cutting tools for soft substrates like acrylic and plastics. These are commonly used for badges and wayfinding signage. The tips come in a variety of sizes ranging from .010” to .171” tips. The smaller tips are for fine detail and the larger tipped tools cut bold fonts and large fills more efficiently. High speed steel engraving tools are rotating cutting/engraving tools that can be used for cutting plastics and scribe engraving soft metals. They’re not as durable as carbide tipped cutters, but are very effective when you need a more resilient tip for jobs like fine deeper engraving in aluminum or brass. The tip sizes range from .005” to .030”. Diamond scribing tools are non-rotating tools for scribe or scratch engraving on trophy brass, aluminum, and stainless steel. If you’re not sure which tools to start with, we suggest a handy starter kit. Roland offers tool starter kits for its best selling models that include a variety of cutters, engraving tools, and related accessories. In addition to the above, as your business grows, you may find a need for high speed mills for 3D engraving, burnishing tools for producing a smooth finish on engraved metals, and ADA cutter tools for Braille patterns. For a complete list of available engraving and cutting tools, plus handy tips about proper use and maintenance, please refer to the Engraving Tools FAQ. Substrates: Because rotary engraves are so versatile, there are dozens of different kinds of substrates you can use. The most commonly uses are acrylic sheets for badges and wayfinding signage and brass plaques for trophies. Innovative Plastics offers an impressive array of engravable acrylic substrates that can be used to produce anything from plain generic name badges to decorative metallic finishes. Click here to browse IPI substrates. What about cost and profit? Is the equipment investment likely to pay off? As with any business endeavor, your efforts, as well as the size and quality of your customer base, will be critical factors. But adding rotary engraving to a robust sign and graphics business can reap dividends. For a thorough presentation of the opportunities, marketing strategies, and profitability in rotary engraving, please download Roland DGA’s Beginner’s Guide to Engraving for Profit. For a quick overview of the profit in simple engraving jobs, consider the following examples. If you have customers interested in total integration of indoor and outdoor signs, an engraver is a good investment. If you are in an area with lots of new construction and office space, you can make extra money installing ADA signage. If you want to diversify and distinguish your self as a one stop graphics shop, a rotary engraver might be just what you need to carve out new business opportunities.